Library furniture can be difficult to shop for, but if you have vision, you can turn even a stuffy, crowded room into a bookish haven. The key is to understand basic interior design for such a task-orientated place. 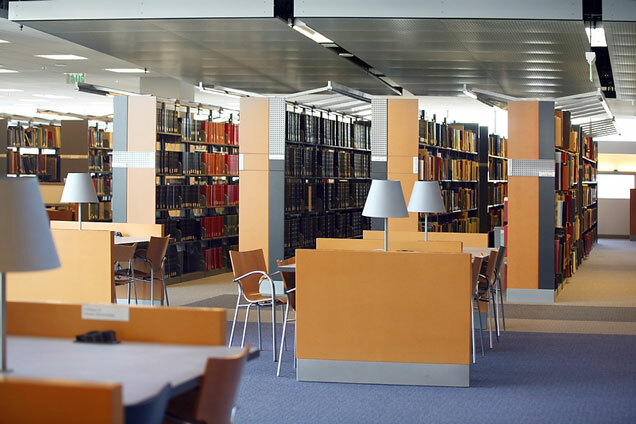 Here are a few helpful guidelines for furnishing your library. Unless they're browsing the shelves, no one ever reads while standing up, so make sure you offer plenty of places to sit. You'll want to spread them out, too, offering some seats by the windows for leisure reading and others around tables or work stations for productivity. Not all chairs are created equal. Buy both wooden kinds and ergonomic kinds; buy ones that roll and ones that stack. Think about other seating arrangements as well, like couches, chaises, benches and armchairs. You can't have a library without shelves, but it's important not to purchase them without consideration for durability and longevity. The right kind of shelves will last decades in your establishment, so look for hardwood that won't chip or splinter easily. You'll just wind up paying more in the long run. While it's a good idea to shake things up with your seats, the same thing with your shelves will only lead to disorganization and disaster. Whatever kind of shapes, sizes and colors you decide to buy, grab them in bulk. These are just a few tips for creating a comfortable space for your fellow bookworms. For even more ideas, click here!